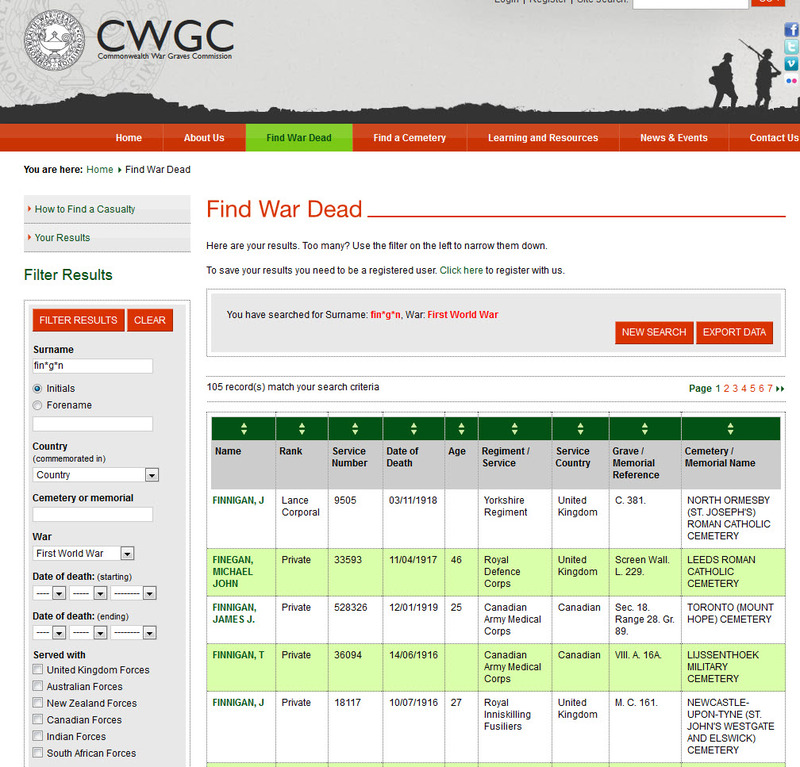 In the last post we started to discuss the search options for the advanced search screen of the Commonwealth War Graves Commission website at www.cwgc.org. We discussed ways to search on Surname and Forename, so please do have a look at the last post. Let us take a closer look at some of the other search options and what they mean for your searches, and why you may want to use them. Country – use this if you know where your ancestor is commemorated. France is not a good choice as there is hundreds of thousands who died there. But if you know that your ancestor died and is commemorated in Argentina, then you are in luck as there is only two options. Cemetery or memorial – this is useful if you want to get a sense of context, or possibly see who else might be remembered in that location. If you start to type a place and there are multiple options a list will appear. 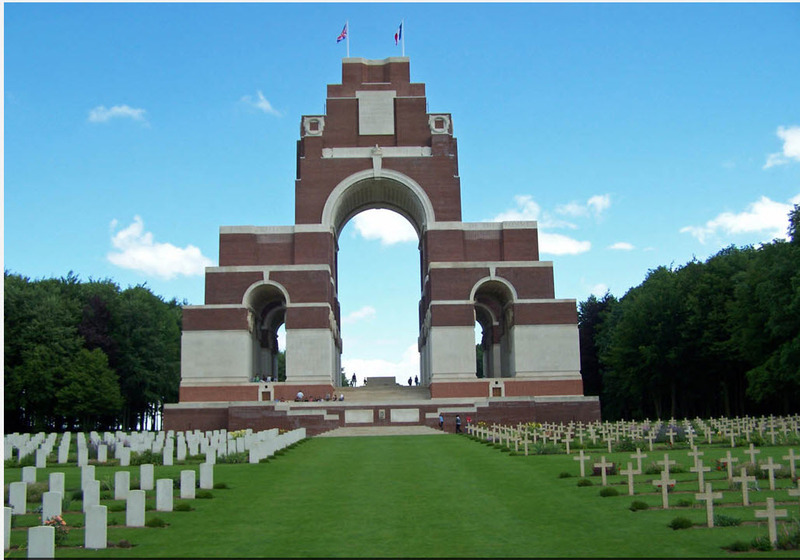 For example, searching on Thiepval brings up four options, selecting Thiepval Memorial and searching on that location shows that 72,338 individuals are memorialized on this one memorial. These are the people for whom no identifiable remains were located to be buried. Corporal Robert Finnegan discussed in the last post is one soldier named on Pier 4D, face 5B. Date of Death – starting and ending – allows you to define a period in which your ancestor died, or to determine how many others died on a given day, possibly indicating if he died in a major battle or in a quiet time. For example, a search for the names of those who died on the 1 July 1916 names 18,708 individuals and obviously does not include those who died from their wounds over the following days. This was the worst day in British military history if you did not already know that. Served with – lists the forces of the United Kingdom, Australia, New Zealand, Canada, India and South Africa. Be very cautious here as people from the United Kingdom may have served in any of the colonial forces, and many from the colonies did serve in the United Kingdom forces. Served in – identifies the branch of service – army, air force, navy, merchant navy, civilian war dead and miscellaneous. The last category may need some clarification for this includes: munition workers, Red Cross members, Voluntary Aid Detachments, canteen workers, army cadets, ambulance drivers, war correspondents, etc. Rank – as you start to type in this field a list of options appears from which to choose. Service number – this search may be useful if you have this number from another source, such as a medal roll and want to identify where he is buried or memorialized. Regiment – can be used to narrow a search, or used with dates to put a death into context. Again when you start to type a list of options appears. For example, searching on the Royal Inniskilling Fusiliers for the 1 July 1916 shows that there were 833 deaths in this one regiment alone on this day. Secondary Regiment – should be used with caution as the majority of records contain nothing in this field. Awards – this enables you to identify those individuals who were awarded a medal (such as the Victoria Cross), or were Mentioned in Dispatches. Returning to the 1 July 1916, with the Royal Inniskilling Fusiliers, and identifying Victoria Cross recipients we identify Eric Norman Frankland Bell of the 9th Battalion. The descriptive citation is provided, adding more color to the day Robert Finnegan died, for the 9th Battalion preceded the 11th Battalion out of the trenches moving towards the German lines. Additional Information – can be any term but it would need to appear in the additional information part of the database. It might, for example, be used to identify others from your ancestor’s village or street. There is a lot of material in this database and some experimenting with the search options will narrow your options to find your ancestor, at the same time additional information can be gleaned to put your ancestor into context. 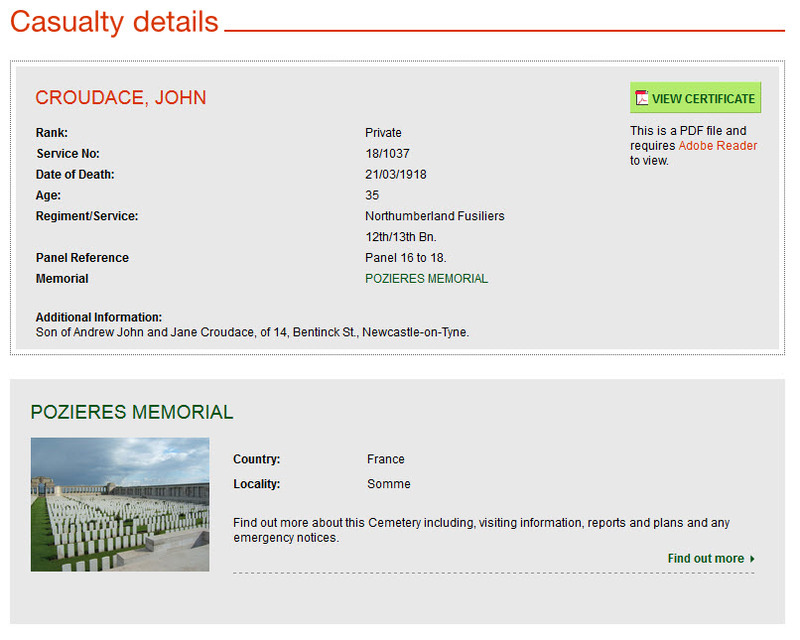 In my last posting I did a simple search to find my dead soldier – John Croudace. 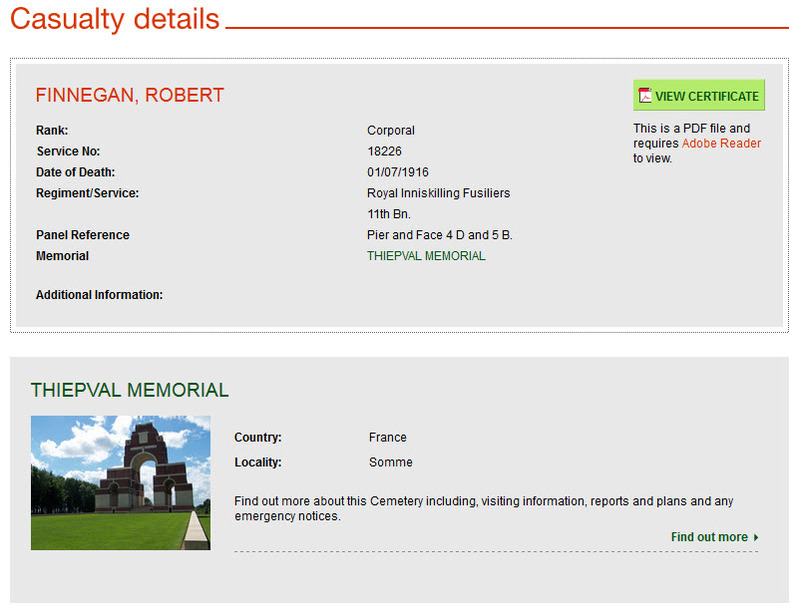 In this blog posting we are still working with the Commonwealth War Graves Commission website at www.cwgc.org website but let’s examine the advanced search options a little more closely. To find the advanced search you can either choose it from the simple search box on the home page, or you can select “Find War Dead” from the tab bar. Either way you end up at the same advanced search box. Note that you only need one entry in any one box to do a search. Let’s start with the first and second boxes for surname and forenames as these are the most commonly used. You can type in any surname and search. The default for the forename is initials and I on the first pass leave the space below blank. Only if I get too many options do I insert an initial. Inserting an initial will pick up the entries in the database that use only an initial as well as those forenames beginning with that initial. This gives me a total of 101 options. However, I prefer to get all my results at once. So searching on “fin*g*n” picks up all these and a few more for a total of 105. The additions are the names – Fingleton and Finighan. The results are presented in batches of 15 names. With these numbers of results I tend to scan all to see if any are a likely possibilities, for remember you are also looking to trace the cousins, as almost every family in the United Kingdom was impacted by the war. 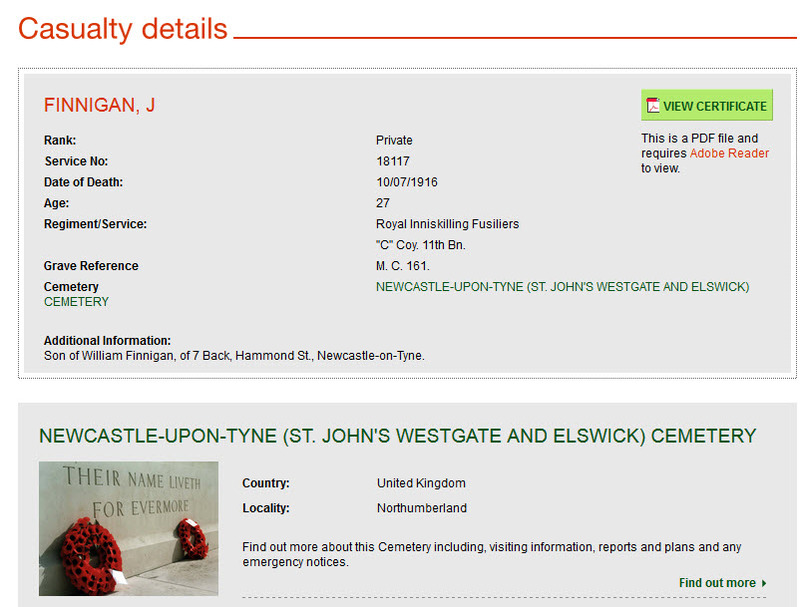 In this search one entry jumped out at me on the first page – Finnigan, J – buried in Newcastle-Upon-Tyne (St. John’s Westgate and Elswick) Cemetery. Looking at the details in the illustration he died 10 July 1916 and most importantly he is described as the son of William Finnigan, of 7 Back Hammond Street, Newcastle-Upon-Tyne. A supposition, later confirmed, was that John Finnigan was wounded on the 1 July 1916, the first day of the Battle of the Somme, and that he was wounded severely enough to be evacuated back to England. He actually died on the transport ship returning to England, and was buried in his home town. John was a private in “C” company, 11th Battalion of the Royal Inniskilling Fusiliers. Interestingly John has a brother Robert, and when the rest of the list is examined there is a Robert Finnegan, who is a Corporal in the 11th Battalion of the Royal Inniskilling Fusiliers, killed on the 1 July 1916, the first day of the Battle of the Somme. In this case though there is no data entered in the additional information section. From this source alone I cannot confirm if this Robert is or is not the brother of John. He is, but other sources are needed to confirm that. In the next blog posting I will discuss some of the other search options, why and when you might want to use them. 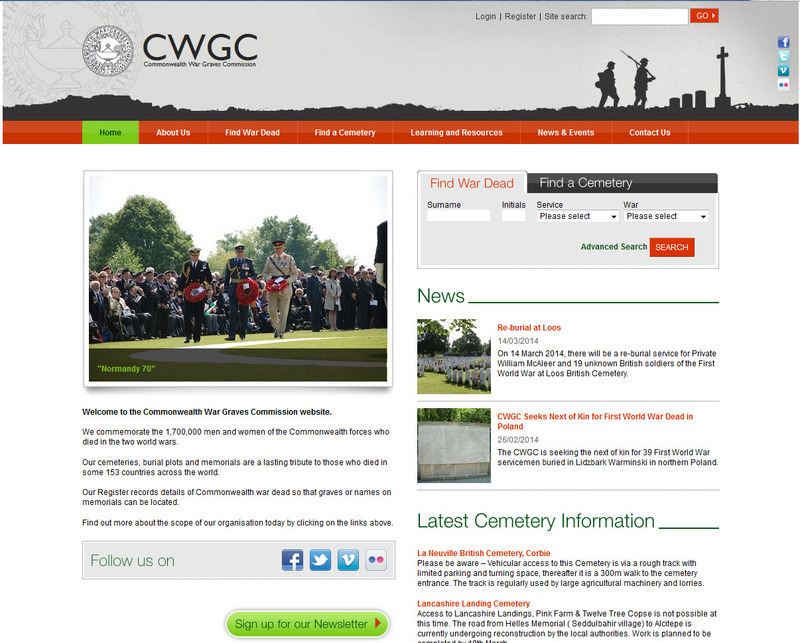 Home Page for Commonwealth War Grave Commission Website with simple search box in upper right. I said in an earlier posting that this year I was going to have a special focus on World War One research. 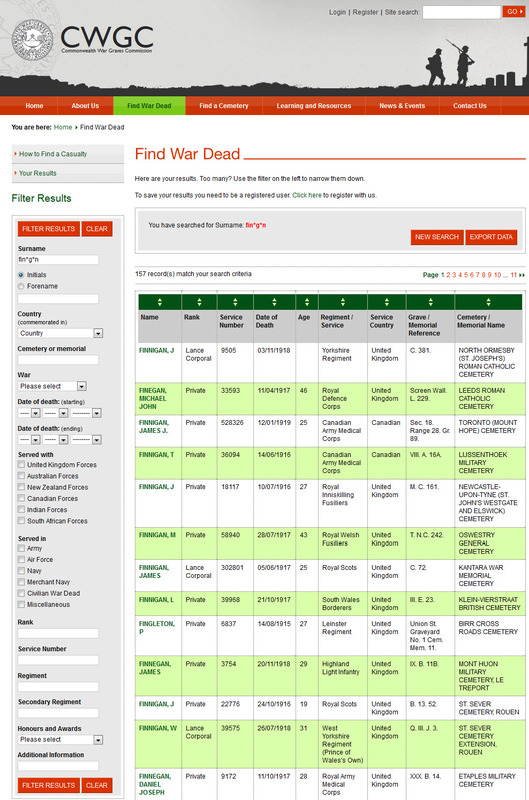 I have had a couple of postings mentioning new resources, but now I want to start explaining how to use the existing resources to trace your World War One ancestors and to put them into context. Let’s assume your ancestor did not survive the war. The place to start is the Commonwealth War Graves Commission website at www.cwgc.org. The Commonwealth War Graves Commission ensures that the 1.7 million people who died in the two world wars will never be forgotten. The Commission is responsible for marking and maintaining the graves of those members of the Commonwealth forces who died. It therefore cares for cemeteries and memorials in 23,000 locations, in 153 countries. One of the sad parts of these numbers is that for many the person in the grave is unknown, and for many on the memorials no identifiable remains have been recovered. Don’t lose hope though. For the family historian the important resource provided is the index to the 1.7 million who have died in the two wars. There are 1,059,642 names from the WWI and 649,489 names from WWII. Let’s start here by defining for this database what period is being searched when WWI is selected. The first day deaths are recorded is the 4 August 1914 with four deaths, while the last day for recording WWI deaths is 31 August 1921 when 24 deaths were recorded in England, India and South Africa. Remember that the war began on 28 July 1914 with Austria-Hungary’s declaration of war with Serbia. England declared war with Germany on 4 August 1914 and so four members of the British Armed Services lost their lives on the first day of the war. England declared war later against Austria-Hungary on 12 August 1914; against Turkey on 5 November 1914; and against Bulgaria on 15 October 1915. Let’s jump right in and do a search, partially because that is what most people are going to do. 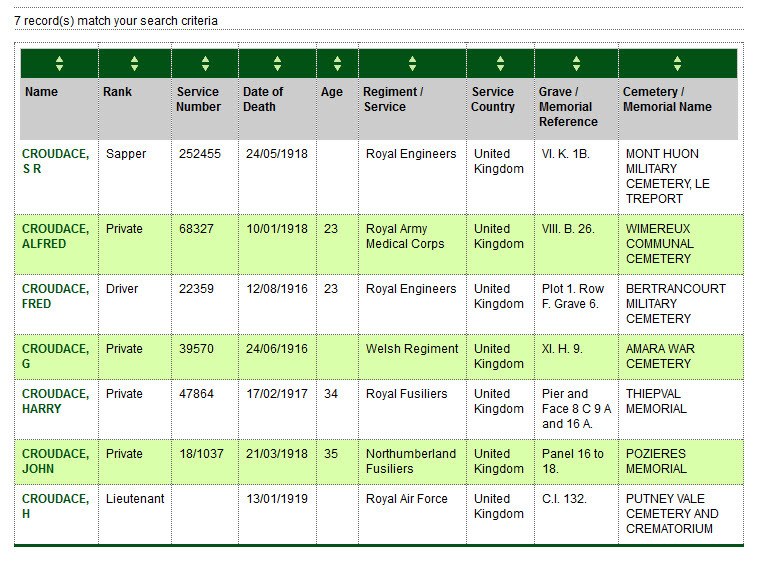 From the home page you can do a simple search using: surname; initials; service; and war. For this illustration I am doing a search on the name Croudace, and I choose WWI. I have seven results listed, and this is definitely one of the benefits of an unusual surname. In this case I can examine all seven results by selecting the surname on each line in turn. The soldier I actually need is John Croudace. The results shown are in a standardized format. What you hope and pray for is data in the Additional Information field for without it you may or may not be able to positively identify your serviceman or woman. 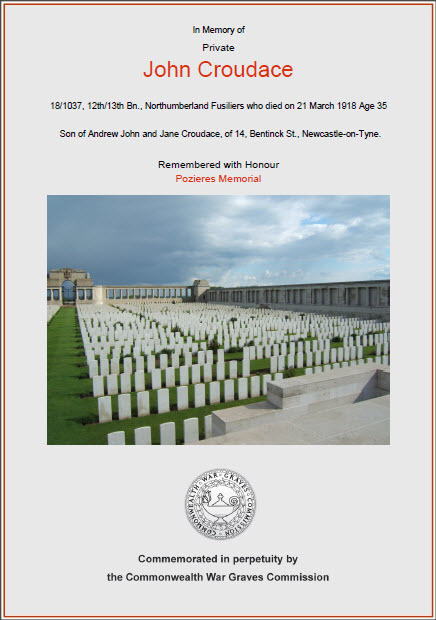 In this case we learn that John Croudace is the son of John and Jane Croudace, of 14 Bentinck Street in Newcastle-on-Tyne. I have John with his parents (A.J. – Andrew John and Jane Croudace) and siblings at this address in the 1911 census. I have my serviceman. The standardized data fields are: name; rank; service number; date of death; age; regiment/service; grave reference, and the cemetery where buried or the memorial where his name is inscribed. There may also be the valuable additional information. The additional information was drawn from the soldiers paperwork where they often, but not always, named parents, or wives. This is especially valuable as many of those documents were destroyed by fire during World War II. I will come back to what has survived of these records in a later post. There can also be extensive information with photographs on the cemetery where the person in buried. Presentation Memorial Certificate for John Croudace. In the upper right corner of the casualty details box is a button for – view certificate. This is a very nice certificate to print to remember your serviceman or woman, and to insert into your research files. Please note that one key piece of information is missing from the certificate which would be vital if you are planning on visiting the cemetery or monument. What is missing is the grave reference number, or the panel number of the memorial. We will take a closer look at this website in the next blog posting. The posting of this review comes as a result of a specific question following one of my recent lectures at the Dupage County Genealogical Society Conference. 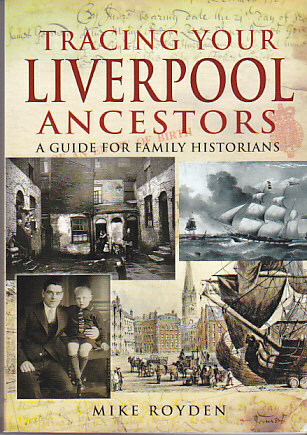 Tracing Your Liverpool Ancestors: A Guide for Family Historians. By Mike Royden. Published by Pen & Sword Family History, 47 Church Street, Barnsley, South Yorkshire S70 2AS, UK. www.pen-and-sword.co.uk. ₤14.99. US Distributor: Casemate Publishing, 1016 Warrior Road, Drexel Hill, PA 19026. www.casemateathena.com. $32.95. Australia Distributor: Gould Genealogy & History, P.O. Box 119, St. Agnes SA 5097. www.gould.com.au. AUS$44.95. 2010. 260 pp. Illustrations, index. Softcover. Royden is a well-known writer-lecturer and authority on the history of the city of Liverpool in Lancashire, England. That knowledge, experience and advice comes through clearly in this research guide. This book is so clearly focused that it is a must for anyone with Liverpool connections. The book is divided into two sections; work and economy; society; plus appendices. The book begins by describing the development of the city, beginning with its fishing village origins. It did not begin to develop until after 1647 when it became a free and independent port no longer subject to the Port of Chester. Rapid expansion occurred in the 1660s and 1670s with the expansion of the town, development of local industries, the discovery and development of local salt deposits. Then during the eighteenth century it rose to prominence because of the transatlantic slave trade, along with its growing importance as a port and center of shipbuilding. Until around 1700 Liverpool remained one township within the parish of Walton but land enclosure and land development was changing the rural agricultural area, but the town boundaries did not start to expand until the 1830s, while the close by towns of Birkenhead and Ellesmere Port did not exist yet. The geographical isolation of Liverpool within England changed during the industrial revolution with the development of roads and turnpikes, the construction of canals and in 1830 the opening of the Liverpool to Manchester railway. The second section focusses on society by examining: housing development; poverty; health and charity; religion and migration; education; and the experience of war. In the process of examining these subjects Royden identifies the history and records of the local institutions and organizations that impacted the lives of our ancestors. No matter at what level of society, what ethnic or religious group your ancestor belonged to he or she will have been influenced by these institutions and local organizations. This book puts everything into local context and directs your research. What makes this volume different and even more valuable, from other regional guides in this series, is the very frequent and extensive guides to further research and reading attached to every topic discussed in the book. Inter-library loan will give the reader access to most of these resources. The book concludes with six extensive appendices (71 pages): a research guide – pulls together information on the familiar family history records we search; a listing of archives, libraries and local study centers – providing contact information and identifying their primary holdings; web resources – identifies local history links, local photography sites, and locally focused forums and message boards; other useful organizations and resources – describing purpose, meetings, publications and contact information; museums and heritage centers – contact information and descriptions of holdings ; and recommended reading. It should be noted that even though the recommended reading list is very extensive and arranged by topic making it easy to use, it is not comprehensive and that the relevant section within the text should also be read as often additional recommendations will be made.